March 16, 2016 – ESA’s Rosetta spacecraft has revealed a surprisingly large region around its host comet devoid of any magnetic field. At the interface between the solar wind and the coma of gas around the active comet, particle collisions as well as sunlight can knock out electrons from the molecules in the coma, which are ionised and picked up by the solar wind. This process slows the solar wind, diverting its flow around the comet and preventing it from directly impacting the nucleus. Along with the solar wind, its magnetic field is unable to penetrate the environment around the comet, creating a region devoid of magnetic field called a diamagnetic cavity. 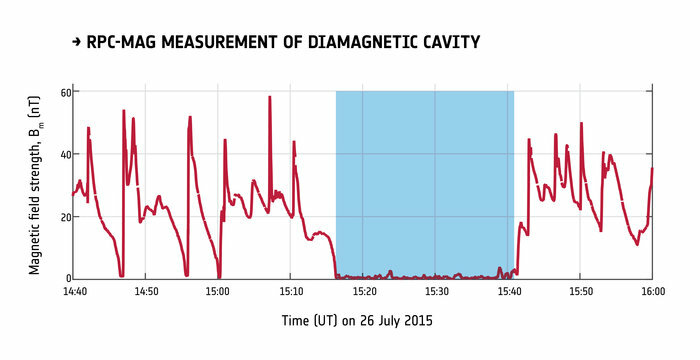 Götz is the lead author of a new study, published in the journal Astronomy and Astrophysics, presenting the detection of a diamagnetic cavity obtained by RPC-MAG on 26 July. The paper describes one of the most spectacular measurements from almost 700 detections of regions with no magnetic field made by Rosetta at the comet since June 2015. “We were able to detect the cavity, and on many occasions, because it is much bigger and dynamic than we had expected,” said Götz. To investigate why the magnetic field-free cavity is so much bigger than predicted, Charlotte and her colleagues looked at measurements performed around the same time by other instruments, such as Rosetta’s scientific camera, OSIRIS, and the Rosetta Orbiter Spectrometer for Ion and Neutral Analysis instrument, ROSINA, to verify whether any anomalous changes in the comet’s activity could be pushing the cavity away from the nucleus. 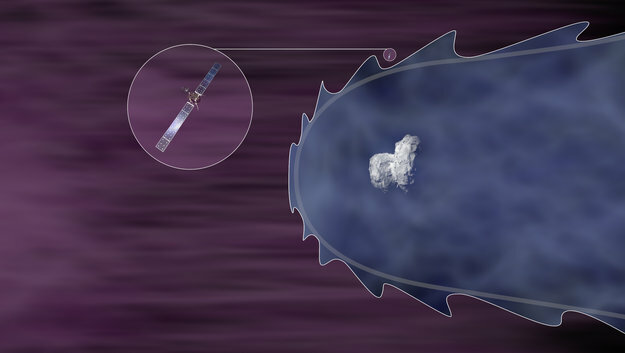 While one of the cavity detections, on July 29, occurred in conjunction with a strong outburst of gas and dust recorded by other instruments on Rosetta, this seems to be an isolated case. Almost all of the other observations of magnetic field-free regions, including the one recorded on July 26, were not accompanied by any appreciable increase of outgassing. “To account for such a big cavity in the simulations, we would need the outgassing rate to be 10 times higher than was measured at the comet by ROSINA,” said co-author Karl-Heinz Glassmeier from Technische Universität Braunschweig, Germany, principal investigator of RPC-MAG. “What we are seeing is not the main part of the cavity but the smaller pockets at the cavity boundary, which are occasionally pushed farther away from the nucleus by the waves propagating along the boundary,” said Götz.